The next morning I woke up at about 8 because I was set to meet a group of people at 11 so that we could all go to the post office and send extra stuff home. This was very important to me as I would not be going home after the program as was the initial plan when I had left the United States 11 months earlier. Instead I would be traveling around Europe again, this time alone, but that meant that I could not bring with me two 50 pound (23 kilo) suitcases, because every time I wanted to check that extra bag, it would cost me an arm and a leg, not to mention the struggle of taking public transportation with those, and then trying to bring them from wherever I was dropped off to the hostel I would be staying at in any given city. It is not realistic to take a taxi to and from the airport in every location, because taxis become pricy, especially for tourists because the drivers like to increase the price when they see you are foreign. I had bought a carry-on suitcase when I went to Kazan’ a few weeks previously because I knew I would need it. I spent my morning packing up one of the suitcases to send home and logging all of the contents (because you have to write them down during the shipment process, in addition to getting all of the paper items together that I wanted to send home. I ended up with a backpack full of notebooks and textbooks to send, and my suitcase. I think there were only three students who took advantage of the opportunity to send stuff home. Russian post is really slow, so I wouldn’t expect these things to arrive home for about a month, but at least it is not too expensive. It was about 5500 rubles to send home my 16 kilo suitcase and two packages of paper items, each weighing about 4 kilos (maybe about $100, probably a little more, and even though it seemed like a lot, I had to remember that each time I checked that extra bag, it would cost about $75, which would add up quickly). The whole process probably took about 1 ½ to 2 hours to complete because of the paperwork that had to be completed. Today, (about 2 weeks later) one of the packages of books has arrived home. The books do not have tracking numbers, although the suitcase does. I have checked the progress of the suitcase multiple times, but the last entry was when it got accepted through customs and into shipping in St. Petersburg, which also happened about two weeks ago. I can only assume that it is on a ship somewhere out at sea (it is cheaper to ship by land, so this is why it would be at sea and not in the air) on its way to the United States. Perhaps I will stop checking for progress for a week in the hopes that more information shows up the next time I look. After I turned these items over to the Russian post, I went in search of a few last minute souvenirs even though I had just shipped stuff home to make room and so that my suitcase wouldn’t be overweight. I spent many hours arranging and rearranging the contents of my bag so that everything would fit, but making sure to put the heavier items in my carry-ons. In the end I had one 50 pound bag to check, one carry-on rolling bag and a backpack. When I finally finished packing I hung out with my host mom for the rest of the day and watched Russian television. She called a taxi for me to get to the airport after spending time calling all of her friends and asking if they knew the best taxi company. (A very Russian thing to do. Any time something interesting was on television, or my host mom wanted to tell someone some news, or maybe there was a holiday, she would spend a long time calling up all of her friends to tell them about it or ask whatever question she needed answered). My flight was around four or five in the morning, but I had to leave my host mom early at about one to get to the airport before the bridges went up. By taxi it only took about half an hour to 45 minutes to get to the airport, so I had to wait at the airport all night. As I was leaving my host mom’s place, she told me that I would always be welcomed back and that if I ever came back to St. Petersburg, to come visit. I did leave her contact information for me, but I have never seen her use a computer. I know my host dad uses one to skype, so perhaps when he returns the information will be more useful. In previous posts I apologize, I say I am sorry I could not post, I was sick or there was no internet. I know, oh but I know that you don’t read this, so why do I bother. I write my day down on paper and I see that you are busy and you do not read it. I was told I should write a blog. We will read it, they said, and yet, nothing. I am not offended or hurt, who wants to read the unedited ramblings of a young woman on her travels? Stories told on paper are different, are harder, so now, I write for myself. If these letters on paper bore you, you took too long, now they are for me. On Tuesday we woke up early enough to make sure all of our belongings were packed up and could still have time for breakfast. Ali and I had been half joking about taking some of the bread with us for the train. I decided at the last minute that I didn’t want to bother, but Ali took a couple of pieces and wrapped them in napkins then slyly slipped them into her bag. After placing our luggage safely in the storage room, we proceeded to explore the castle that our hostel was a part of, but the part that we had not yet ventured into. We could only see the outside of it without paying, but, although castles can be really interesting, we decided not to pay to enter it. Perhaps there would be other opportunities for seeing more magnificent castles or areas. I have been in so many tour groups and on so many guided tours at this point that I tend to shy away from them unless they come highly recommended. Some guided tours can be really good, or the place the guided tours take you can be very interesting, but I didn’t think that in a castle such as this that it would be interesting enough to be worth my money. We had talked about taking our luggage down the hill with us after exploring the castle, even though we had a little bit of time to kill, so that we wouldn’t have to climb back up the hill. In the end we decided to climb back up the hill, which I was glad about because my luggage becomes very heavy after carrying it for some time, especially since I have Ali’s laptop in addition to my own in my backpack are resting on my shoulders. (The castle had a tower. At night a Christmas tree would light up in front of the already illuminated tower). Instead of going straight back to the Christmas markets where we had spent the last few days, we spent some time wandering in some streets that did not have the markets. Since I still wasn’t feeling particularly well, I was not thrilled by the extra walking, but it was nice to see something other than the market fronts and shiny lights. During our wanderings we happened upon a bakery of sorts. Our quest for peppermint had still not been completed but we found candy canes in this bakery. Unfortunately when I tried one, they turned out to be cherry flavored instead of peppermint. So, the quest continued. Around lunch time we headed back to the market to buy something to eat before we headed up the hill to get our luggage so we could catch our train. This was the first train we would get on where we would use our Eurail passes which looked like useless pieces of paper that actually cost about $500 each. We weren’t sure exactly how they would work because people online suggested different methods in terms of their use, but our plan was basically to get on the train, pull out the pass when it was needed and write in the correct information. Walking from the hostel on the top of a hill down to the train station was probably a 20 minute walk, which was not fun with all of my luggage and not feeling well on top of that. On the way to the train station, Kenzy and I bought some candied nuts again to eat on the train, Ali doesn’t like nuts, but she was happy with her bread. From all of the selections of candied nuts in the Christmas Market, I had only tried the vanilla almonds, but I liked them enough that I figured I did not need to try another kind. This train ride was only supposed to take an hour leaving at 12:45 and arriving at two-ish because it was a high speed train. However it ran at least 40 minutes late so we arrived later than we had planned to. It did not spoil our travel plans that we arrived later than intended because our plan in each city has been to just take each day as it comes. We are traveling for over a month and two of us already experienced being under the weather on this trip, so it is better to take it slowly and enjoy as much as we can within reason. It would really ruin our plans, however, if one of us became too sick to leave their bed. (I probably forgot to mention we visited another church. It was large and beautiful of course). When we arrived at the train station in Munich, it took us a while to find out where to go because of the different information desks for different purposes. When we finally found out, it was at least an hour later. We took two trams to get to our hostel. The actual trip from the train station to our hostel did not take an excessive amount of time because trams move rather quickly from place to place, but it seemed like forever because we were all carrying our luggage. When we got to the area of the hostel, it was not hard to find because it was a huge building with international flags painted in circles on the front of it. The outside of the hostel was very nicely painted and the reception area did not seem too bad either. However, when we got to the halls that the rooms were located off of, it was not as well presented, but it was clean enough and we could sleep there, which is what counts. (Stained glass and the high ceilings. This church was interesting because inside it had small posters that told how the church was almost completely destroyed during World War II, but members continued to go to services even when it was in ruins and over time the church was slowly rebuilt, but regardless, members still went. That’s faith). After checking in and finding that they had the most ridiculous system to unlock the door. It took us at least fifteen minutes to unlock the door, by which time Kenzy had already headed back down to the front desk to ask for another demonstration on how to unlock the door. I had unlocked the door accidentally after fiddling with it for a while. When we finally got inside, we had a room with four beds, so because our group is only three people we wondered if they would room another random person with us. (I tried to take a picture of the front of the church, but it was too tall). For the rest of the day (because it was pretty late by this time) we planned sort of what we would do the following days we were there. We also ran to a grocery store we had seen on our way to the hostel because we were in the city around the time of a major holiday and didn’t know when stores would be open. Other than that, the day was drawing to a close and Christmas was almost upon us. No other person showed up to take the empty bed that night, but we still had a few nights ahead of us. Today is actually the 24th that I am writing this. I figure I am already four days into my winter break trip, and the days are flying by so I need to start writing my blog before I fall behind. I know, I know, it’s Christmas Eve, but what better present to give you, than to share my adventures with you because I cannot give you anything else at this point. I am going to start from the beginning, back when I was still in St. Petersburg. The night of the 19th, some good friends, who I had met over this last semester, and I went out for a rather fancy goodbye meal at a restaurant called “Gogol,” named after the famous Ukrainian writer. The whole restaurant was set up in the theme of a flat from the 19th century, with each room having a different theme. Pieces from his stories were also pulled into the restaurant as added decoration. The menu was even in the form of a book and although we used the English version where the translation did not hold the same charm, the waitress explained that often customers would keep the menu during the meal just to read it from cover to cover. We ate in the dining room I think, but there was also a library as well as some other rooms. The meal included a variety of dishes, differing slightly for every person. We started with drinks, splitting a large bottle of water (because you have to pay for water in Russia) and ordering some of their homemade, flavored vodka to try. The two flavors of vodka we tried were something like raspberry and buckthorn. I don’t remember completely now because it was five days ago and so much has happened since then. I definitely liked the raspberry one better, but most people preferred the buckthorn. For our first course, many of us ordered salads. 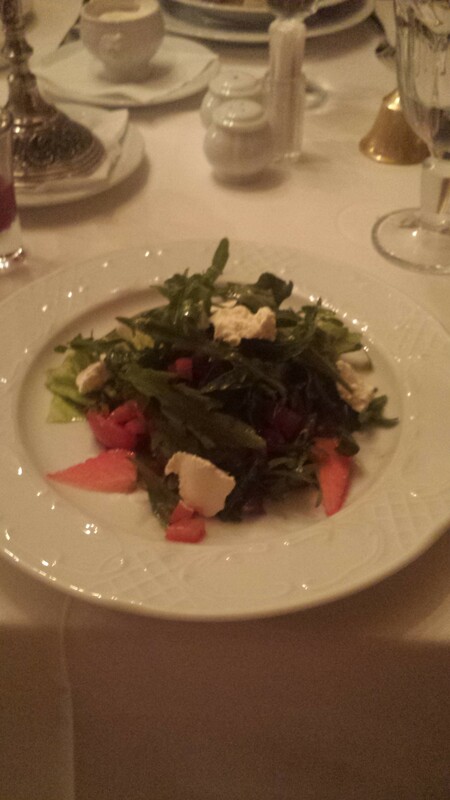 It was actual dark green leaves, sort of like a spring mix (hard to come by in Russia for a salad from my experience), with some sort of cheese, tomato and a smoked meet of some sort that they said they smoked in the kitchen of the restaurant. The meat on the salad was something new, but it was actually very good and very worth it. Other first courses that were ordered included borscht and pelmeni. For the main course most of the people in attendance decided on a dish called Chicken Kiev, which I, not being a very fond of chicken, had never tried. I had the opportunity to try a bite from one of my friend’s plates and I can see where other people might enjoy it, but it is definitely not a dish I will order for myself. Another one of my friends ordered Beef Stroganoff, which I also got to try. It was actually pretty good and, of course, dill was used in the dish. Personally, I ordered venison with apples and some sort of sauce (I don’t recall what it was) that was very good and purple. My meal was delicious, although not everyone enjoyed their meals as much. I was too full for dessert so I did not order anything, but among my friends such dishes as chocolate cake with sorbet, strawberry soup and another kind of sorbet from something none of us had ever tried. I mentioned dill was in the beef stroganoff, accompanied by the phrase “of course.” It is common knowledge, at least from my point of view, that foreigners, who spend enough time in Russia, realize that Russian’s put dill on everything. For example, one of our program directors, Liz, told us a story about when she made a grilled cheese sandwich and let some of her Russian friends try it. It had been after a long time of just having Russian food and she finally made a grilled cheese sandwich and was so excited to have something familiar and share it with her Russian friends. They tried it and agreed that it was good, but said, “Liz, this is good, but you know what would make it so much better? Dill!” Her reaction was of course immediate disappointment and sadness that her friends would want to taint something like a grilled cheese sandwich with dill. Back to my story on Friday night. I over think things and get anxious about what needs to be done sometimes and I had not packed for the impending journey that started the next day, so as the meal went on and it got later, I enjoyed every bit of it, but I started feeling the need to get home. I did not want to rush my friends, but I knew I needed to leave so that I could pack and have some peace of mind before I left my current home (in St. Petersburg) for another adventure. The bill came out to 10,000 rubles for 7 people, which was maybe $170 at the time. Definitely a bit above the price range I would normally pay for a meal. That night while all of my friends spent their last night out enjoying each other’s company, I stayed in and packed. I wasn’t concerned about saying goodbye to my host-parents because I know I will be staying with them again come spring semester. They had company over on my last night in St. Petersburg for that semester anyway, so obviously they weren’t concerned. However, once they found out that I had finished finals (5 finals in 2 days), which I had actually finished the day before, my host mom quickly went and got something. It turned out to be a small bag of socks and underwear, which she presented to me in front of her guests. I did not quite understand, but she said it was some sort of tradition to give these gifts when someone finishes finals. I have tried to look it up online with no luck, so maybe it is a joke? When I have better internet I will message my host-mom in Kazan’ since she speaks English too, to ask her if she knows, although she is Tatar, so we will see.